I have talked about antivirus solutions many times including few ways to disinfect your PC when the system cant even boot properly after the infection by virus. Today i will talk about something similar, when your system needs to be cleaned or disinfected after being infected with a virus and you cant even access your desktop properly. Cleaning and remove virus is not an easy job if the computerÂ affected by virus is having some special administrative rights to perform any operation, that will auto disable all admin permission on the particular computer. Worst to worst some user prefer reformat or reinstall the Operating System rather spend time to clean and remove the virus. But with BitDefender Rescue CD, you can use it to clean and remove the virus on their computer. 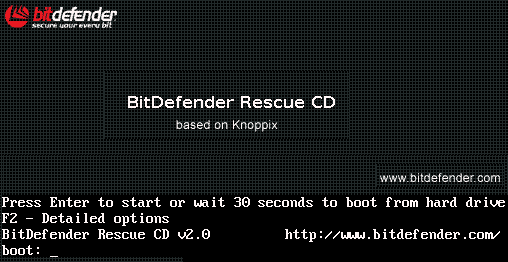 BitDefender Rescue Disk , is a bootable anti virus scanner based on Knoppix to boot, that scansthe system for any virus. To start using the CD set up the BIOS of your computer to boot from the CD, put the CD in the drive and reboot the computer. After being presented with the initial start-up screen, press Enter within 30 seconds to continue lo ading the CD contentÂ or the computer will boot from the hard drive. In a few moments you will see text scrolling on the screen (as can be seen in the picture below). The boot process might take 2-3 minutes to complete, depending on your hardware configuration. Note: During the boot process the product will also be updated with the latest virus definition files if an Internet connection was detected. As soon as the boot sequence has completed successfully you’ll be presented with the graphical interface where you will be able to initiate the scan by pressing Start. By default, all detected partitions will be scanned. Depending on the capacity of the hard drive and on the number of files, the scan process might take a while.When the scan completes, you’ll have to choose what actions to take on the infected file(s). You can choose one action for all files or select an action for each item. After you’re done, you can click the Finish button to exit the wizard.To exit the graphical interface, right-click anywhere on the desktop and choose Exit.